Although governments of 193 countries had promised way back in 2015 to end tuberculosis (TB) by 2030, the global annual rate of TB decline since then has been much less than what is required. 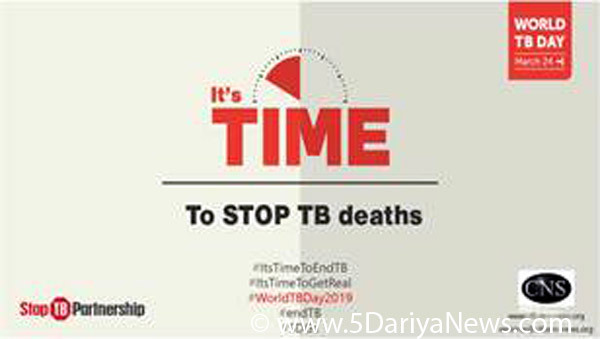 The rate of TB decline which is currently hovering around 1.5%, should catapult to over 10% by 2025 globally, in order to end TB by 2030. But some countries do give hope; like Thailand, which has already achieved a TB decline rate of around 10% (source: WHO Global TB Report 2018). The number of drug-resistant TB cases also saw a 13% reduction in Thailand in the past year.“We try to bend the curves towards ending TB more sharply by implementing WHO End TB Strategy. The National TB Programme of Thailand (NTP), MOPH [Ministry of Public Health] has come a long way in combating TB”, said Professor Emeritus Piyasakol Sakolsatayadorn, Minister of Public Health, Thailand, in an exclusive interview with CNS (Citizen News Service).Concerted and well-coordinated multi-sectoral action coupled with strong commitment from top political leadership has indeed made a difference in Thailand’s fight against TB. This has resulted in the approval of National TB Strategy in Thailand by the cabinet with additional funds to support TB case finding through latest molecular diagnostics and chest radiography especially in high risk groups (such as people in prison). However, funding gap continues to slow down the fight against TB. Financing also becomes scarce for R&D of new TB diagnostics, drugs and vaccines. Countries like Thailand are tapping on innovative and domestic financing mechanisms to bridge this gap. Thailand’s domestic financing for TB control went up by more than 200% between 2015 and 2017, setting an example for other high burden TB nations to up their national TB budgets.“The funding gaps do not only occur with Thai NTP [national TB programme], but these gaps, especially R&D also still exists at the global level. However, we attempt to fill these gaps with the budget from the existing health service system. For other additional budget, it will be allocated by the priority issues such as monitoring of TB contacts, treatment of MDR-TB, and social support to improve treatment collaboration” said Thailand’s Minister Piyasakol Sakolsatayadorn. “Furthermore, multi-sectoral collaboration approach can also bring us to the successful story. The budget framework has been used on developing a national strategic plan, operational plan and estimating costs of activities by relevant parties, for instance, the Ministry of Justice in coordination with the Ministry of Public Health (TB screening and care to prisoners) and the National Health Security Office (treatment for TB and laboratory test).”Weak health security puts people at increased risk of diseases like TB. Moreover, fragile health systems will threaten to reverse gains made in TB control. Universal Health Coverage (UHC) model of Thailand has received global spotlight. “With more and more focus on UHC and knowing the fact that the outcomes for TB control really depend on how good your health system is, domestic investment for health systems’ strengthening and support is eventually going to pay dividends for TB control” said Dr Soumya Swaminathan of WHO. The next United Nations High Level Meeting (UNHLM) will focus on UHC, with Thailand as co-facilitator, along with Hungary. The President of the UNGA has appointed Vitavas Srivihok, Permanent Representative of Thailand, along with Katalin Annamaria Bogyay, Permanent Representative of Hungary to co-facilitate the UNHLM on UHC to be held on 23 September 2019 on the theme of “Universal Health Coverage: Moving together to build a healthier world”.Last year at the UNGA, country leaders met at UNHLM to end TB and adopted a Political Declaration on TB, which also calls for a progress report in 2020 and a comprehensive review by heads of state and governments at a high-level meeting in 2023.“Three critical components - funding, action, and accountability - will be pivotal to the success of the initiatives of this UNHLM on TB” rightly emphasized Dr Suvanand Sahu, Dr Lucica Ditiu and Dr Alimuddin Zumla of the Stop TB Partnership in The Lancet Global Health special feature in the lead up to this year’s World TB Day.TB is curable and preventable but still it remains the leading infectious cause of death worldwide. It’s high time to end TB!